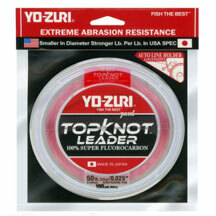 We were fortunate enough to get our hands on a supply of the new Yo-Zuri TopKnot fluorocarbon leader in various strengths. We are very familiar with Yo-Zuri fluorocarbon leaders ad have been using the HD Carbon leader since it first become available. This is the prefect leader for bottom fishing rigs, bite leaders for plugging, and wind-on leaders. We still feel the HD Carbon is a better choice for twisted (twisty) leaders because it has more stretch. The extra abrasion resistance makes it the best possible choice for bite leaders. The low diameter and lack of stretch makes it the best choice for wind-on leaders. However, if you make your own wind-on leaders, you may want to rough up the section that is inserted into the hollow braid. The 200lb test actually fits perfectly within 200lb spectra hollow braid. The 80lb and 130lb test are best used with 130lb spectra hollow braid. We tested various knots including clinch, improved-clinch, bimini, perfection loop and others. Because of the low diameter, lack of stretch, and the hardness (it simply would not crush) this meant that ALL the knots tested stronger than any we have ever tested before. Visit the Yo-Zuri website to see all the specifications.